My parents moved up to Cameron Park which is near Sacramento, a 2-3 hour drive from where I live in San Francisco. I also sold my car back in April, which makes getting up there to visit them an interesting event. Over Thanksgiving I rented a car to get there which ends up being a little pricey (but still costs me a lot less than if I owned a car). Anyway, I wanted to make another trip up there to help them move into their new house, and so I thought I’d try the train. I assumed I’d get some work done on the ride up, something I definitely couldn’t do if I was driving, but I was having too much fun watching the view out the window. Sweeping views of the north bay. The train snaked along the edge of the bay for 45 minutes. The funny thing about living in the Bay Area is that you don’t see the bay very often because it’s obscured by buildings or hills. Even on the bridges, you don’t really get to see the bay because the railings are quite high. If you take a ride on this train, you’ll get some of the best views the bay has to offer. There is a down-side of course. The train isn’t the most convenient way to travel. Just getting to the Emeryville train station probably took me an hour, and then the train was late. The train ride itself will probably be another 2 hours, and then I still have to get picked up in Sacramento, so now add another 1/2 hour to get to my parents house. All told, the journey will probably be about 4 hours, when driving takes between 2-4 hours depending on traffic. $18 one way isn’t bad though…. I’d probably have to pay $130 to rent a car for two days. Considering I got to enjoy the view and relax instead of stressing out in traffic, I think it was well worth it. I was recently introduced to ThinkHost. I use DreamhHost now for this blog and my personal email, but I like the fact that ThinkHost is powered by 100% renewable energy. * When I still owned a car, I bought a TerraPass. * TerraPass has a home offering as well now, to offset the energy consumed in your home. * GreenDimes aims to help you reduce the junk mail you get from the USPS. I’m sure there are other ways to lower my carbon footprint. Any ideas? I’ll be presenting at the STIRR mixer on Wednesday night in Palo Alto. If you’re there, please stop by and say ‘Hi!’ to me or Clint. Can you pick out the big screen among the sea of people? It seems to be common knowledge throughout the world that Americans could care less about the World Cup. 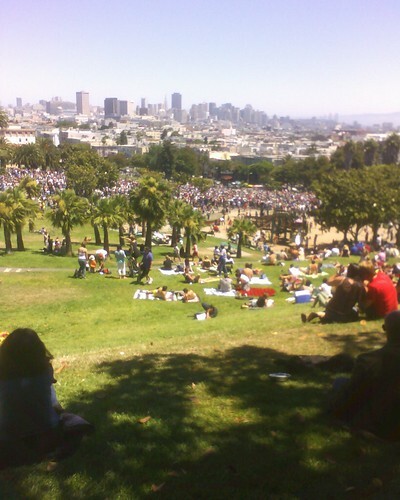 After watching the final match between Italy and France at Delores Park here in San Francisco, I’m not so sure that sentiment is true. I took a few pictures with my camera phone, and as you can see, LOTS of people turned out to see the game which was displayed on a fancy LED screen. I’ve never seen this many people in the park before. Afterwards, the Space Cowboys provided beats to finnish off an amazing summer day. More Flickr photos here.